My Book shelf, next to my Computer. Submitted by MarkO on Fri, 2015-01-16 06:28. 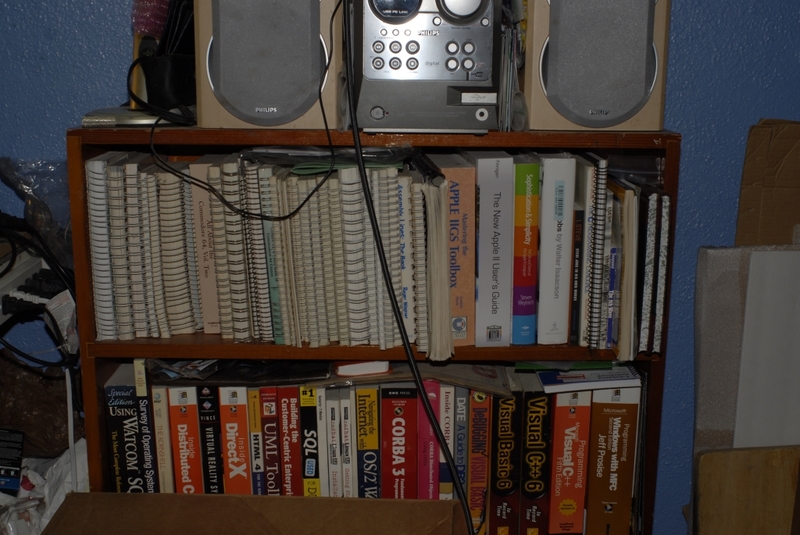 Middle Shelf, Various Subject Matter, including Watcom SQL, D-COM, DirectX, UML, SQL, RedHat Linux, OS/2, CORBA, DB2, and Visual Studio 6. The "hidden" bottom shelf has some 1950's Hard Cover Robert Heinlein Books, a Danny Dunn and the Homework Machine, Ben Bova's The Dueling Machine, and a Story Collection edited by Robert Silverburg, all Discarded from a School Library, a Paper Back of Steven Levy's Hackers, C Programmer's Guide for Serial Communication ( covers CP/M and MS-DOS ), Embedded Multitasking ( with a focus on PIC Microcontrollers ) and some Catalogs..